Horatio Alger Letters is kicking off our new week here at AnchoredScraps.com with looking at historical letters by the prolific American writer. On my bookcase is a very old hard bound issue of the 1872 “Strive and Succeed” by Horatio Alger, Jr.; it has been in our family a very long time. Recently I was sharing with a dear friend that successfully taking on a diet for me meant taking an Horatio Alger approach to it – to lift oneself up by your own bootstraps and do what is required with hard work. Over at the Horatio Alger Society there are several Horatio Alger Letters shown with scanned image of the letters along with text of the original handwritten letters. The three page “Letter to Richie Sheafe” from October 16, “(1894? )” was especially enjoyable to read with his suggestions on digging for gold. I mail you today a copy of “Digging for Gold.” I hope it will reach you, and that you will let me know of its reception. must be sure to have the moon shining over your left shoulder. When you begin to dig, say in a distinct tone “Elorum foolorum rattledebangdorumslapdashimus. That will bring the gold if there is any there. You needn’t dig more than ten or twelve feet down. If your father should manipulate the ground before you begin your chances of finding something would be increased. on a story which is now being published in a paper in New York. But we are much pleased with our visit, and remember with pleasure the pleasant friends whom we met on our way back. Mr. and Mrs. Cheney send regards to your father and mother, and I send love to my little friend Richie. There is the “Postcard to Mr. Alber, May 18, 1893. Natick, Massachusetts” (image on left) that includes the cancel date stamp. 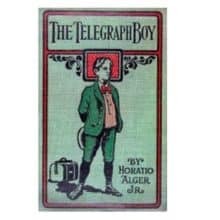 At the Northern Illinois University Libraries there is the Horatio Alger Digital Repository that includes letters from Horatio Alger, Jr.
See if you also have an old Horatio Alger book on your bookcase or go select one at Project Gutenberg for free – and take a few minutes to enjoy reading. Here’s to kicking off our Monday, to successfully making the time to eat healthier, and a great week ahead – Happy Monday!